Popular treehouse designer Antony Gibbon is at it again. Antony Gibbon Designs has produced a new treehouse design, The Embryo, which is a cylindrical two-story tree structure that almost looks like an extension of the tree trunk, like a burl. This image reinforces the notion that our homes should be an extension of Mother Nature. The entrance to The Embryo is similar to its predecessors. A hatch door leads up to the first floor, where a spiral staircase wraps the internal walls of the cylinder and connects the first to the second floor. The floor area is maximized by pushing this spiral stair to the outer portion of the interior space. The treehouse can sleep eight people comfortably. Long rectilinear windows help to bring in great natural daylighting into the space. Because of the shape and configuration of the treehouse the door and windows can be arranged depending on the site conditions presented by each individual treehouse. Just came across a photo of these on Tumblr.. I'd also have loved to see the interior! They look something out of a fictional world. The Embryo derives its name from the early stages of development in nature and how we need to re address the way we live in today's society that is more ecological and simpler way of living than consuming our earth’s resources. We are more and more being disconnected from our natural surroundings and the embryo is part of a series of designs to try and reunite and reconnect us back to the elements and how we interact with nature, whilst using materials resourcefully. The floor area is maximized by pushing this spiral stair to the outer portion of the interior space. 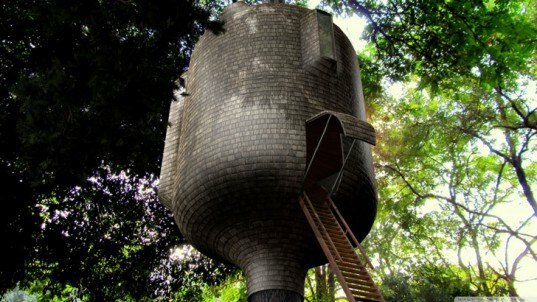 The treehouse can sleep 8 people comfortably. The entrance to The Embryo is not much dissimilar from its predecessors. A hatch door leads up to the first floor, where a spiral staircase wraps the internal walls of the cylinder and connects the first to the second floor. Because of the shape and configuration of the treehouse the door and windows can be arranged depending on the site conditions presented by each individual treehouse. 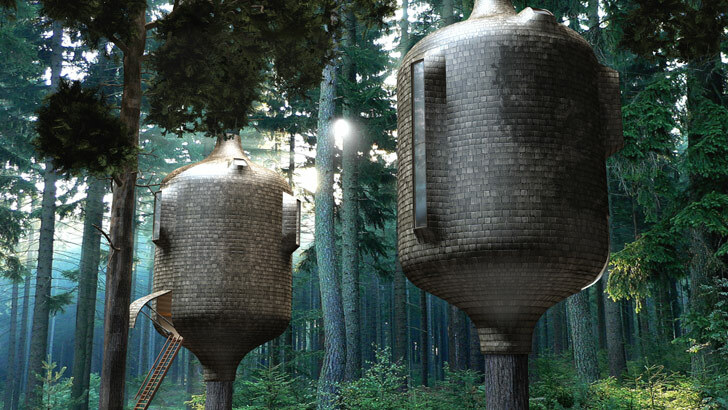 The Inhabit Treehouse and the Roost Treehouse are two previous treehouse designs from Antony Gibbon Designs that have been featured on Inhabitat.